This is the seventh in a series of articles giving brief biographical sketches of the people who owned the Wanstead estate over 800 years. Links are given to sources of additional information on this site and elsewhere. 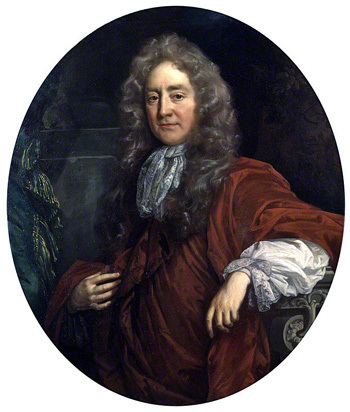 Sir Josiah Child (1630-1699), 1st Baronet (from 1678), was the second son of a London merchant with links to Hackney. The formidable and ruthless Child first became active in business as a supplier of victuals to the Commonwealth Navy. He was in Portsmouth by December 1654, when he married Hannah, daughter of Edward Boate, Master Shipwright, at St. Thomas's Church in a civil marriage ceremony conducted by the mayor Francis Holt. In 1658 Child served as Mayor of Portsmouth. However, in the 1660s he returned to London and bought a brewery. Also at this time he was starting to take an interest in the East India trade. During the following decade Child built up a large block of shares in the East India Company, becoming a director in 1677. Between 1681 and 1690 Child alternated as Governor and Deputy Governor. He was the dominant force within the company during those years, and directed its policy almost as if it was his personal property. “By his great annual presents he could command both at court and in Westminster Hall what he pleased". Ironically, given Child’s relationship with James II, his own political views were whiggish – under the restored Monarchy he had initially been regarded with suspicion as a “commonwealths-man”. However, for him, business always came before political considerations. Child’s interests were not limited to the Indian subcontinent. He was a founder member of the Royal Africa Company and, by 1691, he and seven others owned more than 25% of its stock, investing in the slave trade and plantations in the West Indies. By these various means, Child amassed a very considerable fortune. As well as being active in business, Child had some reputation as an economic thinker: he was author of the influential Brief Observations concerning Trade and the Interest of Money (1668), and A New Discourse of Trade (1668 and 1690). Though a mercantilist and staunch defender of monopoly, Child’s view of money was sophisticated for the time – he grasped, which many then did not, that its circulation and use was of more importance than its function as a simple store of value. Josiah Child’s purchase of the Wanstead estate in 1673 was noted by Pepys, who described it as “a cursed and barren spot, as commonly these over-grown and suddenly moneyed men for the most part seat themselves” which Child adorned “at prodigious cost with walnut trees and fish ponds many miles in circuit”. Sir Josiah Childs's plantations of walnut and other trees, at Wanstead, are much more worth seeing than his gardens, which are but indifferent. Besides the great number of fruit trees, he has planted his enclosures with great regularity, he has vast numbers of elms, ashes, limes, etc., planted in rows on Epping Forest. Between them, these observations suggest that the gardens of Wanstead before Child's time had not been very noteworthy. It may also be inferred that the new avenues and plantations were not considered to be in the gardens as they existed in 1691, which must thus have covered a smaller area of the park than was later the case. Although his work was destined to be modified and elaborated out of all recognition by his son and later owners, it was Sir Josiah Child who was responsible for the third defining moment in Wanstead Park’s history, in that he began the process of creating its unique landscape. He seems to have done little to Wanstead House, however, which retained its essentially Elizabethan form. Married three times, on the latter two occasions to wealthy widows, Child had eight known children. His daughter Rebecca (died 1712) married Charles Somerset, Marquis of Worcester, and heir to the 1st Duke of Beaufort, in 1682. Only a few years after Child’s acquisition of a baronetcy, this marriage represented a major step-change in the family’s status. Rebecca’s son Henry was to succeed his grandfather in 1700 as 2nd Duke of Beaufort. In 1699 Sir Josiah Child died of smallpox, and was succeeded briefly by his son Josiah II, with whom he appears to have been on bad terms at the time he made his will. For further information, see History of Parliament Online. With thanks to Georgina Green for the information she very kindly provided on Sir Josiah Child and other members of the family.